Movie Ramble: A Tale of Two Cities. Written in 1859 and originally published in weekly instalments between April 1859 and November 1859 Charles Dickens A Tale of Two Cities was set in London and Paris before and during the French Revolution and depicts how when the French proletariat got sick of the way aristocracy was treating them they decided that the best response was to execute the lot of them by chopping off their heads using the guillotine! 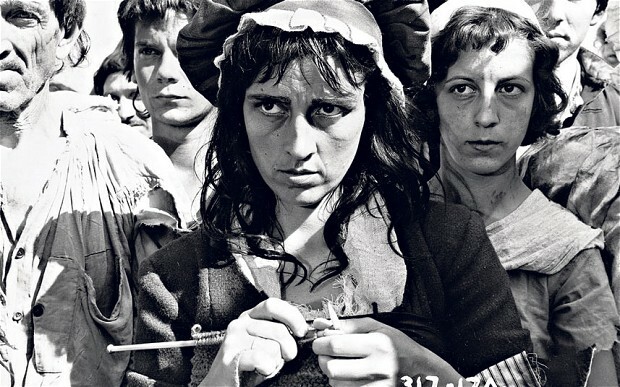 Dickens story set out the social parallels between Paris and London but unfortunately the British did not have the use of the guillotine and to this day are still putting up with the shite served up by their rich overlords. Following four silent film adaptations of Dickens story the first talky was in 1935 directed by Jack Conway and starred Ronald Colman and Elizabeth Allan and was nominated for an Academy Award for Best Picture. In 1980 there was a TV adaptation that starred Chris Sarandon, Peter Cushing, Alice Krige and Billie Whitelaw. But between the two we had A Tale of Two Cities made at Pinewood in 1958. Directed by Ralph Thomas and produced by Betty E Box. 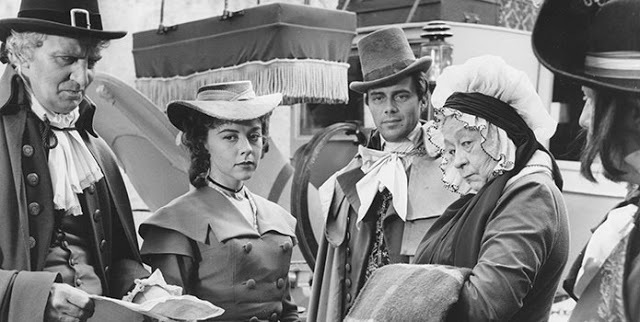 The Rank Organisation movie starred Dirk Bogarde as Sydney Carlton with Dorothy Tutin as Lucie Manette. Stephan Murray, Dorothy Tutin, Bogarde and Athene Seyler. 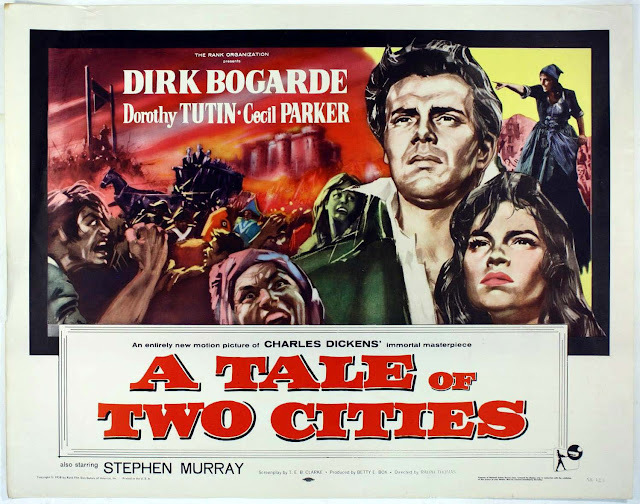 This is affectively a love story set against the storming of the Bastille with Bogarde's character making the ultimate sacrifice for the girl he loves so that she can live happily ever after with his look-alike rival. 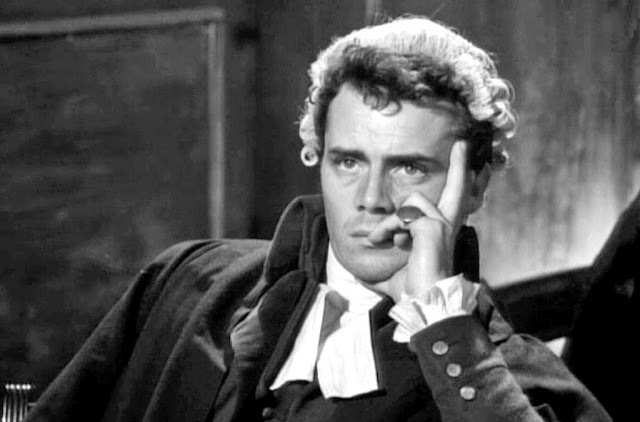 Some critics have commended Bogarde's performance as his best to date, which is not surprising as most of his career changing performances, other than Hunted (1952) came after A Tale Of Two Cities. Mine you the 38 year old actor did look extremely handsome as Carlton, a young lawyer who hates himself and seems to have a death wish slowly killing himself by consuming large quantities of alcohol! Dorothy Tutin (Savage Messiah 1972) does not have to put much effort into her role but there are some stand out performances further down the pecking order including Donald Pleasance as an unctuous spy, Christopher Lee as a sadistic aristocrat and Rosalie Crutchley as a sort of Madame guillotine character who gets a lot of pleasure arranging for the aristocracy to meet there deserved end. Also in attendance among the host of British actors is Cecil Parker as a banker, Athene Seyler as Tutin’s over protective companion and Stephan Murray as Tutin’s father - whose speedy recovery from 18 years in the Bastille is something to be marvelled at! Made completely in a studio does not help to make this the most realistic ‘revolutionary’ film you have ever watched with some scenes so underplayed that the excitement is completely non-existent. But is does pick up in the second half, which is probably more to do with the first half being so soporific and certainly is not a stand out movie in the career of one of Britain's greatest actors.